One of the biggest challenges faced when reviewing Pinball FX3 is that each collection of tables are diverse enough to warrant their own review. A single table alone can provide hours of fun if you are more than willing to put the effort into it, along with the fact that some are much better in design than others. So, it’s refreshing to be able to solely concentrate on a trio of tables and to thoroughly explore what each one has to offer. In this case, we get to look at the Jurassic World Pinball collection that has recently hit the grid. The question is, are they worth adding to your digital arcade library, or are they better off left extinct? Let’s face it, everybody loves Jurassic Park. Well, the first one at least. If you are one of the few who has to be different and doesn’t enjoy the Spielberg classic, then, firstly, you’re wrong. Jurassic Park is awesome, and secondly, you probably won’t be reading this review in the first place, regardless of whether you like pinball or not. For everyone else, this is a collection of three pinball tables – two of which are based on the mainline entry series of the movies: the 1993 iconic original, and the more recent Chris Pratt Raptor-taming sequel, Jurassic World. The third table, however, is a completely non-canon entry that focuses on a squad team dealing with the aftermath of when things go a little pear-shaped on Isla Nublar. Each table feels pleasantly different from each other, with the one based on the original 1993 movie proving to be the most challenging out of the bunch in my opinion. The original feels like the more conventional table out of the set due to its smaller size and presentation. You can activate key moments of the story, including the famous T-Rex chase. Only this time, it takes place on a small mechanical treadmill where smashing the ball up the right ramp within a strict timeframe will help the Jeep Wrangler outrun the two-legged beast. The dot matrix screen gets a little mini-game of sorts too, where choosing the right foods for the Triceratops allows it to mooch further without getting sick. At first glance, it all does seem a little bare bones, but dig a little deeper and you will find plenty of tasks you can activate to coincide with the movie. What made this table the most difficult is that the lanes are angled in a way where you really have to bang your flippers with pinpoint accuracy. A clumsy hit can quite easily result in your ball diving down one of the out lanes, even more so with the repel of the bumpers happy enough to knock it out of play. Gaining a multi-ball requires you to put more effort in, especially in comparison to the other two tables. However, the challenge did entice me to want to master it and, with a bit of practice, I soon got the ball sprinting around the playfield faster than a pack of hungry Raptors. The Jurassic World Pinball table has a slightly larger layout than its counterparts and is the only table that contains four flippers. Missions can be played either in order of the film or in a selectable form when activated. Starting a mission is quite easily done with a few well-placed shots down a sinkhole. It’s here where you can train the Raptors by feeding them your ball in a specific order or take the Gyrosphere contraption seen in the film out for a spin across the island. While it didn’t seem as hard to hit up ramps in contrast to the 1993 table, meeting the demands to fulfil the objectives can prove to be quite tricky. The third and final table, Jurassic Park Pinball Mayhem, felt the easiest one to knock the ball about in. Multi-balls come flying out at you quite frequently, due to the several missions that will activate them. There’s also a Triceratops hiding in a mini playfield under the table where you tackle a gang of rolling Raptors in a specific order. It’s the most gung-ho table out of the set with choppers flying above the cabinet, along with a Commander screaming orders at you while you work to evacuate the civilians. Even the opening table overview has the T-Rex trying to chew the neck off the Brontosaurus in which both dinosaurs play a part in nailing both a skill shot and a super skill shot when you fire your ball with the plunger. There’s a James Cameron “wearing his action hat” sense to this particular table, which never really feels convincing enough to fit within the lore of Jurassic Park. Despite the dinosaurs, it felt to me more of a resemblance to something like Avatar or Aliens due to the roughneck marine theme that’s present. Visually, they all look decent enough and play smoothly in both handheld and docked – unlike the Son of Zeus table which still stutters more than Porky Pig talking to a lady when played on the small screen. To see a mixture of animated dinosaurs interacting with the believable mechanical internals of a pinball machine, shows the imagination and realism working well together in line with the quality that we’re used to seeing from Zen Studios. The sound throughout the collection, on the other hand, is a bit of a mixed bag. Unfortunately, just like the Universal collection, the music rights have not been obtained for this package. This leads to the background music always flirting around the iconic John Williams score in an unbearably teasing fashion. It isn’t poor by any means, just not as authentic as I longed for while playing it. However, the tables are riddled with quotes from the movies with some hitting the mark better than others. While Mr D.N.A does a decent enough job commentating on the Jurassic Park table, listening to the kid from Jurassic World whining “I don’t wanna wait anymore!” every time you fire your plunger is borderline infuriating. 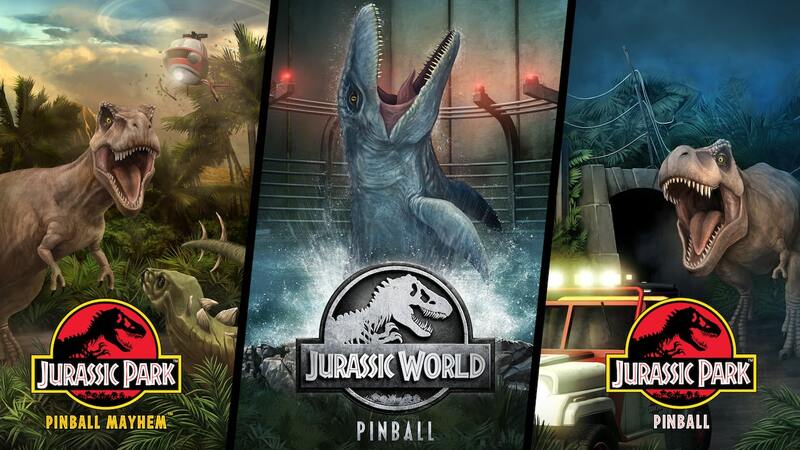 On the whole, the Jurassic World Pinball collection is a nice addition to Pinball FX3. All three tables have their own flow and your favourite will mostly depend on which one you dig into the most. I found myself playing the original table more than the others, solely because it’s the one I originally had the most difficulty with. I would go as far to say that it’s more of an intermediate skill package as none of the tables are ever quite as easy to play as the Family Guy cabinet. However, that increase in difficulty did have me returning for many hours, with plenty more to sink into once I had finally finished this review.